Mr. Torrence is a native Floridian with little formal arts education. As a boy his talent was notice when, at eight years old, he sketched his kitchen, the pictures in his kitchen, and the pictures in them. He has developed his style of painting from looking closely at the techniques used by the old masters such as scumbling, and color theory from the French, as well as, the American Impressionists. Once grasping the reason for contemporary abstraction in art, he worked very successfully at that genre for six years. Since 2010 he has primarily painted landscapes. He imparts to his work, the random principles of abstraction. This, he believes, occurs naturally in nature, where he is constantly looking. 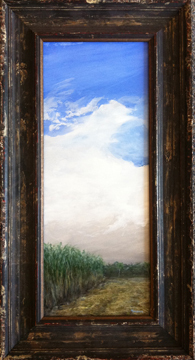 You may see more of Shannon's work on his Facebook Page, and by viewing his LULA artist profile page.